The monastery of Asura is divided between the sangha engaged in the three-year retreat program, and the permanent sangha of senior monks and nuns. The three-year retreatants perform group pujas on the 10th and 25th of every lunar month; these ceremonies, however, are not open to the public. The other regular sangha also performs the Thukdrub Ngakso Puja on the lunar 10th, and the elaborate Chö (Tshogle Rinchen Trengwa) on the 25th. In addition to a daily Tara puja, they also regularly perform pujas upon request. Particularly common are rituals relating to Vajrakilaya due to the associations of the Asura cave. Yearly Buddhist festivals are also marked by special ceremonies. 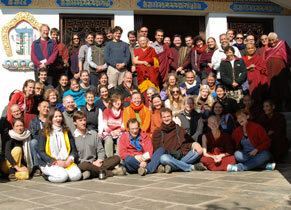 Asura is also host to many yearly programs conducted by Chokyi Nyima Rinpoche. These include programs for Nepali speakers, the retreat that concludes the annual seminar, teachings on the Tara Triple Excellence, and also teachings for monks and nuns. As of 2016, Rinpoche decided to hold an annual thousand-fold ganacakra puja during the festival of Saga Dawa.